Congratulations! It is possible that you have just found one of the best value elite hockey sticks available in the market. Most advancing players are looking for a low bow with the increased stiffness of the top of the range carbon sticks. For me, the Mercian Pro-Line 005 deserves a review to show how it rivals hockey sticks up to twice its price. Therefore making it one of the best hockey sticks available in the market. Lets take a look why. Mercian’s Pro-Line hockey sticks are a small range of just 6 hockey sticks. The Pro-Line 005 is obviously the 5th of the 6 and on balance possibly the best value. In my review of the Mercian Pro-Line 001 I noted the absence of the fantastic material basalt. You will find basalt in the Pro-line 005. Basalt is a melted down, particlized volcanic rock, so as you can imagine packs a punch. Though the Mercian Pro-Line 005 has 70% carbon, the additional benefit most are looking for from a high carbon content hockey stick is still achieved by adding 10% of this volcanic rock material and 5% Kevlar to the sticks material composition. Combine this hard-hitting material setup with the low bow mold of the Mercian late shaft setup and you are going to use a stick that really rivals the top end carbon sticks from all brands. For much less money. I just want to be clear this is not a dispute over whether you get more for your money. Here in the Mercian Pro-Line 005 I am just reviewing that you get an awful lot for the money you spend. Before you move on perhaps take a look for yourself at information on Basalt as a material, feel free to use Wikipedia or something. Also then read more about how much Mercian care about the quality or materials they use in their hockey sticks and you will get a feel for why this matters. With the late bow in the Pro-Line 005 being 25mm at just 225mm up from the ground you are in the elite drag-flicking world of hockey sticks. Almost all forwards and attacking midfielders in the advanced game are working with this shape of hockey stick. Again not unusual to find this shape. Combined with the material and feel of the Pro-Line 005 you have value for money. Also the Mercian Pro-Line 005 comes with the innovative technology that the top of the range hockey stick has. In my opinion Mercian have own of the most advanced vibration control systems, of any of the main brands. Piezoelectric fibres are woven in to the rest of the material composition which by way of some crazy science transfer the energy cause by vibrations in to heat. How exactly only Steven Hawkins can explain but from players I know who have one of the Pro-Line range apparently it actually works quite well. More than other so called vibration reduction systems. Nano-carbon technology is pretty standard now right across the hockey stick spectrum and again features in the Mercian Pro-Line 005. We have also reviewed a number of Mercian hockey sticks and commented on how light they are. Going back to Mercian’s obsession with material they say what they source for their sticks is extra high quality material that works to make their sticks lighter. The Pro-Line 005 is available in Mercian’s light weighting option. And guess what, it is really light which makes it incredibly maneuverable and great to swing quickly. Exactly what you need to pull of quick, shape slap hits. 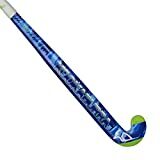 Honestly, if you are looking for a hockey stick which will allow you to develop all the pro skills like hitting hard, slap hitting, drag flicking and want to save yourself some serious cash, the Mercian Pro-Line 005 is your hockey stick. The 2014/15 model has the red head and the cool mix of shinny and matte black on the shaft. I’m not sure but Mercian will probably not change this model too much going forward but if they do you might be able to get a great deal online. Without a doubt this is one of my top tips for a great elite style hockey stick at a fair price. Go for it.